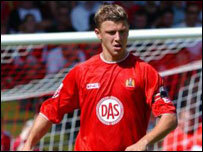 Bristol City footballer Danny Coles has been charged with being drunk and disorderly at a Shropshire pub. The defender was arrested following an incident at the pub in Newport on Thursday evening. Mr Coles, 23, was later bailed to appear at Telford Magistrates' Court on 16 August. A statement by Bristol City Football Club said they were "very disappointed" at the arrest and would investigate more before taking appropriate action.